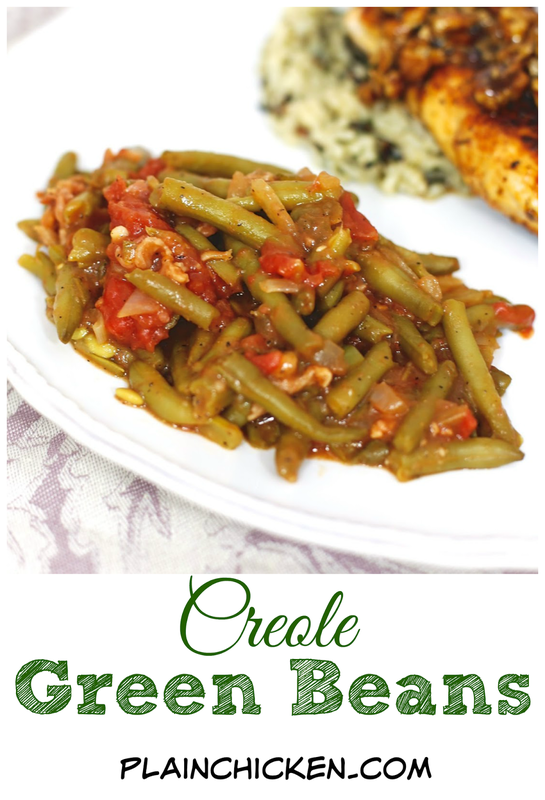 Creole Green Beans Recipe - transform canned green beans into something amazing! Green beans, bacon,onion, green pepper, brown sugar, mustard, stewed tomatoes and Worcestershire sauce. SO good! I could make a meal out of these green beans! 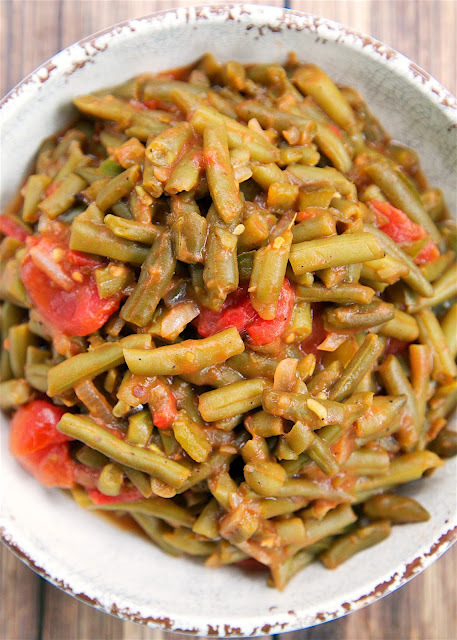 I served these green beans with the Praline Chicken from yesterday's post. They are so good. I took a short cut and used canned green beans. 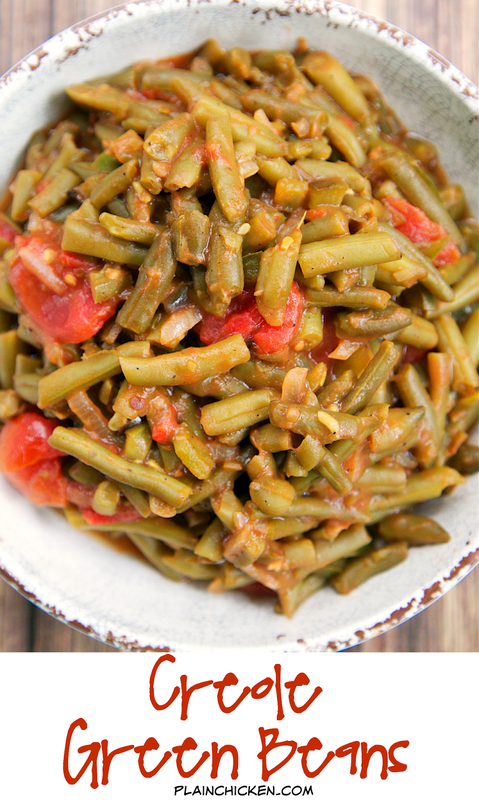 If you have fresh green beans on hand, you can use 1 1/2 pounds in place of the canned green beans. You will just need to cook them for about 9 minutes in boiling water first. This recipe makes about 6 servings. Even though there are only two of us, I made the whole recipe so we could have leftovers the rest of the week. They tasted great reheated and it saved me a bunch of time cooking dinner. Cook bacon in large skillet until crisp. Remove bacon, reserving drippings. Sauté onion and pepper in bacon drippings until tender. Stir in flour, brown sugar, salt, pepper and dry mustard. Stir in tomatoes and Worcestershire sauce. Stir in green beans and cook until thickened and thoroughly heated, about 10 minutes. Top with cooked bacon. I just love your site!!! Look forward to it daily. Lost count of the number that I have cooked. Thanks for the entertainment and the delicious foods! I basically make mine like this but no bell pepper or flour and with smoked sausage in it, too. I'll have to try this with smoked sausage! YUM! 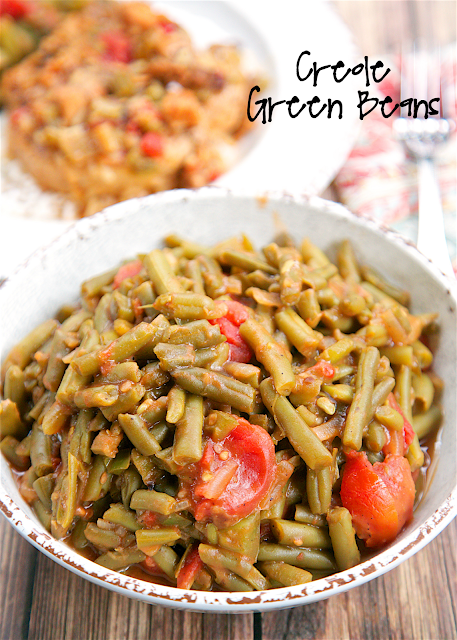 I'm not a big fan of green beans, but tried these and love them! Thanks Stephanie!